The Genghis Khan mausoleum, located in Erdos City of Inner Mongolia Autonomous Region, is a consecrate place to sacrifice the historical extraordinary personality Genghis Khan. 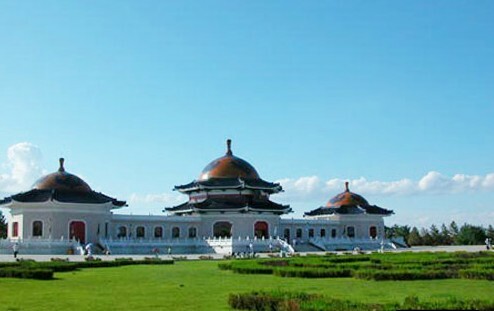 The Genghis Khan mausoleum, located in Erdos City of Inner Mongolia Autonomous Region, is a consecrate place to sacrifice the historical extraordinary personality Genghis Khan. After his death in 1227 by illness, Genghis khan had been buried secretly according to the local custom. In order to commemorate the most outstanding leader, the Mongolian built " Eight White House"(eight moveable white Yurt) as The Genghis Khan mausoleum on the tableland of north desert, and collected the relics of Genghis Khan and put them into his coffin. 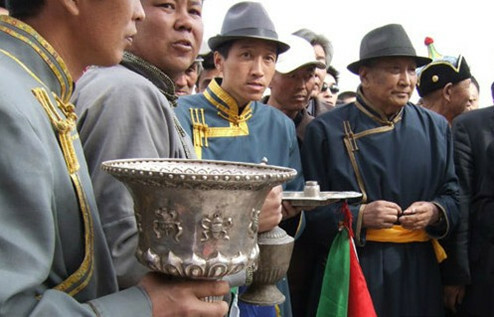 The ceremony mainly embodies the Mongolian worship to their ancestor and hero, Genghis Khan. The ceremony has various forms, such as offer animals and setting fire. There are some special precious sacrificial utensils, which represent the Mongolian love to the nature and animal. The ceremony held once a year. The Sacrificial Ceremony to Genghis Khan congeals the Mongolian national sentiments, and testifies the eternity of their cultures. So to protect the ceremony has a vital significance in maintain the unique Mongolian culture. 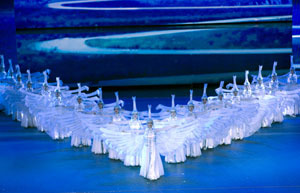 The ceremony mainly embodies the Mongolian worship to their ancestor and hero, Genghis Khan. The ceremony has various forms, such as offer animals and setting fire.